Usually I put all the colors and bling on the front of my cards but this time I wanted to surprise my quiet, dignified son so I kept the front plain and subdued. 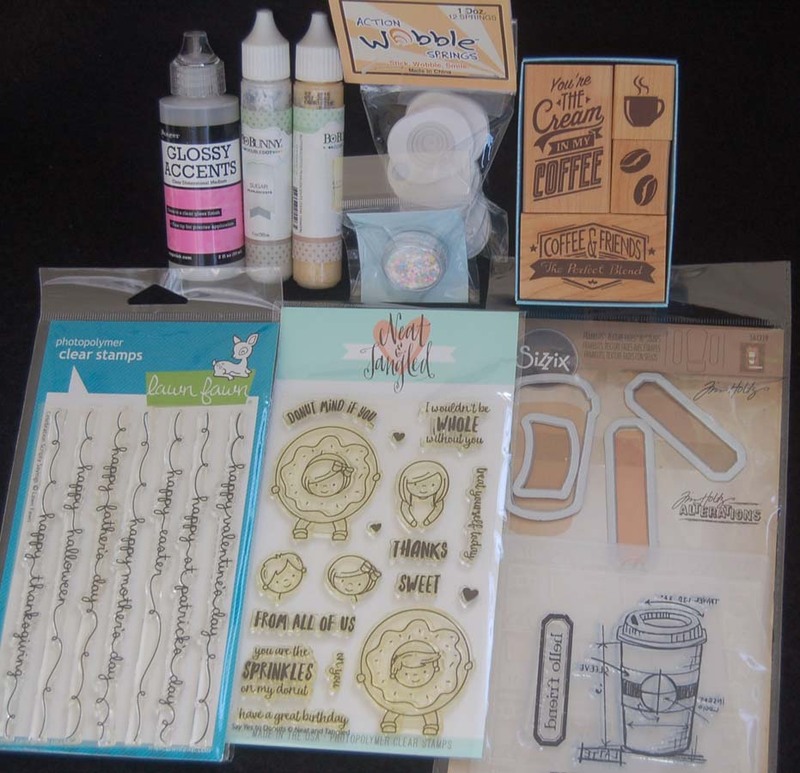 The word stamp is an Inkadinkado product and the blueprint coffee cup is from a Tim Holtz Sizzix stamp set. that were colored with Copic pens and fussy cut. I do have the matching dies but I applied the sprinkles before cutting and the dies of course wouldn't work because the paper wasn't flat...duh? 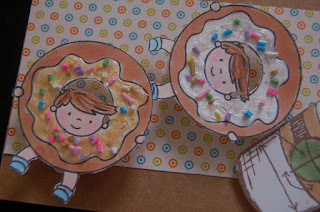 Here's a close-up of the doughnut twins with the Bo Bunny pearlescent paint icing and the fake sprinkles (from HM Ben Franklin Crafts resin department). 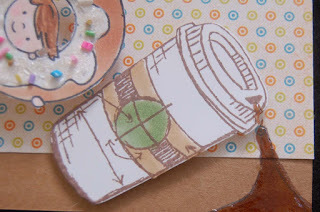 For the spilled coffee I colored the liquid with a Copic pen and then applied Glossy Accents to make it shiny. 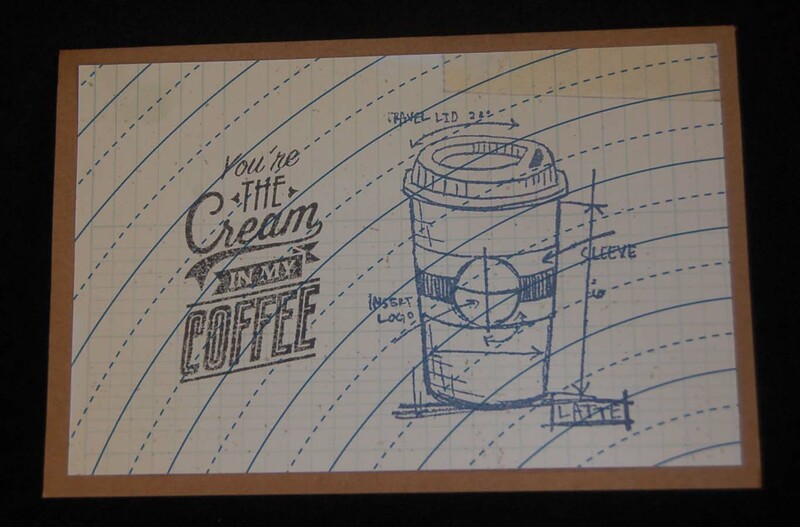 The script words on the inside of the card were made using a Lawn Fawn stamp...lots of useful greetings in this set. The above photo shows how popped-up the doughnuts are because I used the Action Wobble springs that I purchased at HM Ben Franklin Crafts. These plastic springs can be trimmed down to hide behind the image and allow the piece to shake and jiggle. The coffee cup was raised a little with the use of foam dots. I hope you enjoyed looking at this Father's Day card and will take the time to make a card for all the special DADS in your life. Thanks for stopping to read this post. Love to hear from you! 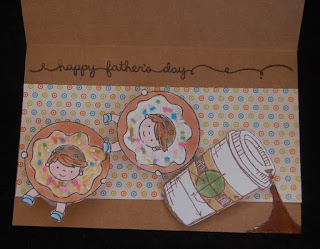 aww this is so cute and I love the little surprise inside.. very creative.